The other night, I went to Fasha and Princess Sophia's humble abode. This abode was the place I called home since I was 2 years old up until leaving for college at 18.
my mother was the Queen of the house and kept it looking quite grand while growing up. Things changed, people moved out, and Princess Sophia moved in. Each and every time I visit, I'm blown away at all of the new additions I seem to find. It's changed so much. And now, it's just so......well...Asian. Fasha and his wife, Princess are the only two people who live in this house. However, they are so gracious and kind enough to leave four slippers by the front door for those guests who forgot to bring their own. 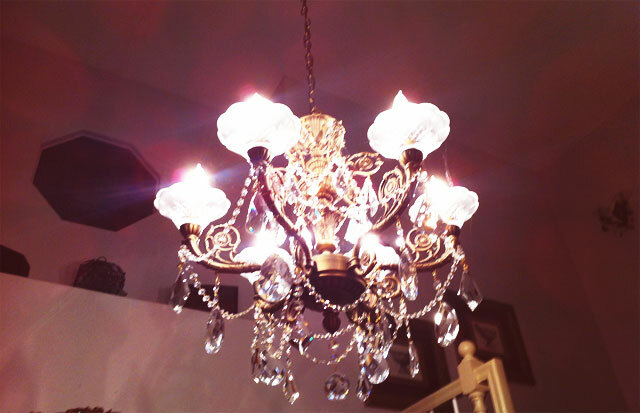 By the front entry, you are greeted by a very large chandelier. To which I have no words for this gaudy piece of metal...so let's just move on. Over here, we have the giant dining room table where they like to invite all of their many Korean friends over to play card games for money. And, what's that? 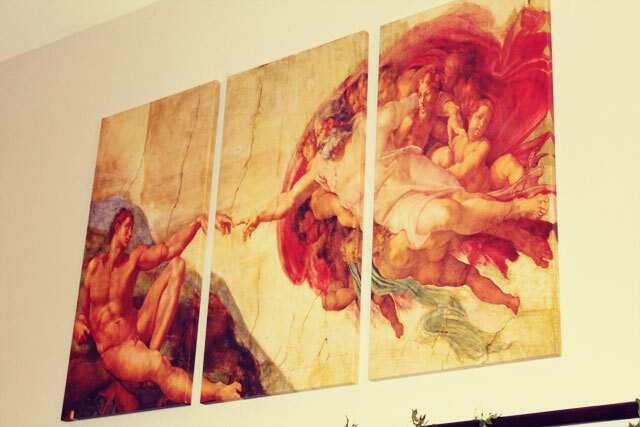 A ginormous painting of The Creation of Adam by Michelangelo? Let's scroll down and take a closer look. Yes. That's exactly what that is. To really get the full effect of a Korean home, you'll have to have a sitting room. Or, as I like to call it, the room crammed full with as many objects and pictures as you can. Feel free to take below picture for a guide to use in your own home! 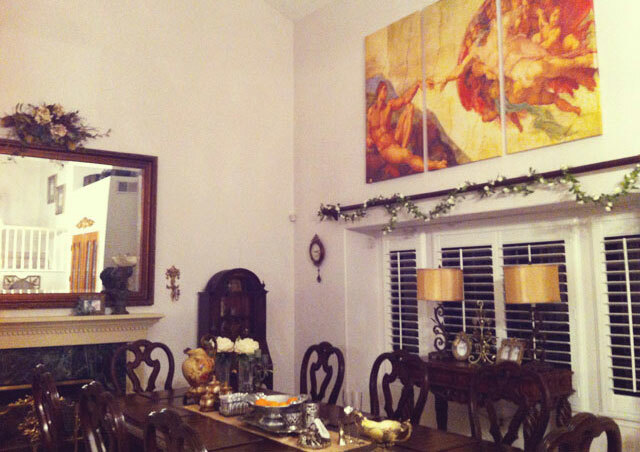 Now, if you couldn't already tell, Fasha and PS are big fans of their European art. So, of course, would their home be complete without the great Mona Lisa?! I'd also like to point out that mirrors are very popular in this Korean casa. Let's head on over to the TV room where you'll be sure to find Korean dramas on all.day.long. And please, take note of all the jam packed little goodies in the floor-to-ceiling wall unit. It really adds to the cinematic feel, I think. And lastly, it just wouldn't feel right if Fasha wasn't playing some sort of musical instrument. 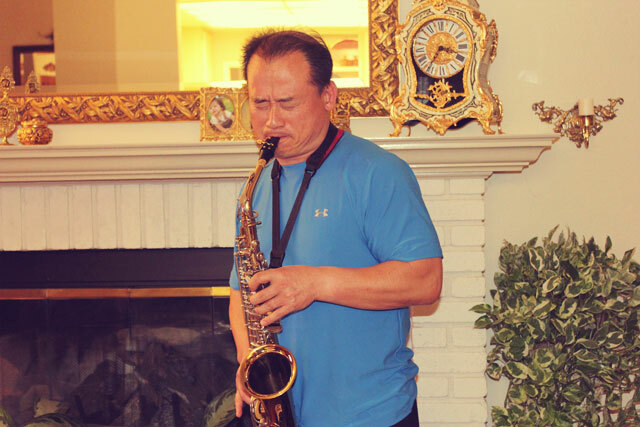 For about two hours straight, he was playing Josh Groben's "You Raise Me Up" on the saxophone. Am I the only one that finds this amusing? So there you have it. You have now been given an exclusive peak into the home of a true Korean. Feel free to come on over any time. Fasha would love to perform for an audience. Maybe he'll even bust out his karaoke machine and sing for you! In fact, yes, yes he will. Can you just narrate my entire life so I can laugh all the time. Fancy shmancy house! Asians love slippers and gaudy art. You are hilarious. This post was amazing. Best house tour EVER! Haha! Your dad is the funniest! WOW! Your dad and PS are pure entertainment GOLD. Get these people and their Asian house a reality show! Your dad's home is my parents' home reincarnated. Complete with cheetah prints and random collectibles stuffed into cabinets. What is it with the KoKos and the collectibles?? i love that swan bowl thing in the china cabinet and i love fasha. i'd like an IRL tour very soon, please. You're fricking hilarious~ You know the only thing better would have been a video tour with you narrating~ LoL ..
Is that a picture of baby Mish on the fireplace mantel? lovely house! 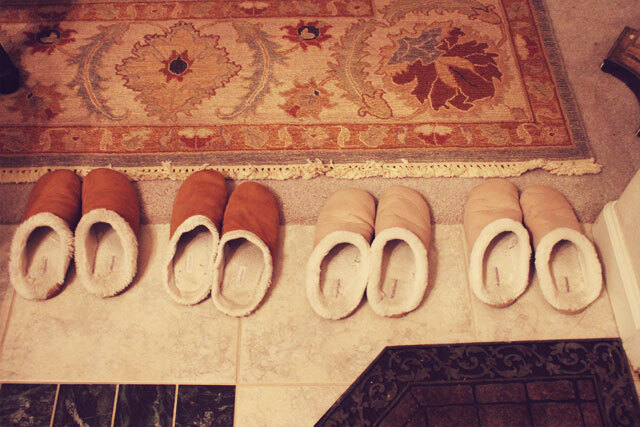 that is so nice they set out extra slippers! im hosting a OPI & Essie Nail Polish Giveaway! Check it out! It's like one big Korean sit com. I have so many thoughts I don't even know where to begin! First, I'm not sure why I'm so amused that the picture of the two of them is on an easel. The Mona Lisa put it over the top for me. They must be so cultured! Josh Groban on the sax?!?! IT'S JUST TOO MUCH. I can't even take it! 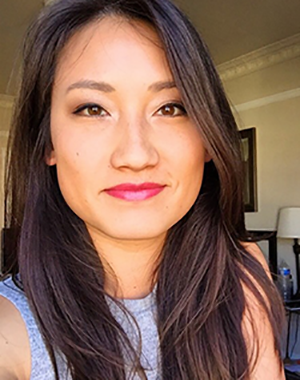 Can I just tell you that you are a fantastic and funny writer?? I really love your style. This post is hilarious and compellingly entertaining - THANK YOU for sharing your life with us!! Hahahahaha Asian houses!! Yours is really nice! Most Asian's houses are empty except for a giant TV and couch, and then a bunch of plastic stools and random stuff. Oh, and you MUST have a karaoke machine. Soo Korean! ...er...does not quite fit the decor, eh? I have no words for this house. But good luck today girly!!!! Fasha and PS totally deserve a reality show. Bigger hit than the Kardashians, I promise. Oh goodness. If I could travel back in time a bit, I would do a tour of my Aunt and Uncle's old place. Potted plants and vegetables lined their steps and jars of kimchee/pickled items lined the refrigerator shelves. Oh my lawd. I love how you endlessly compliment PS. She's just the greatest. Way to take a perfectly good home and put it through a time warp...haha! Hahaha! My mom and step-dad are Thai and I am sooo having flashbacks to the floor-to-ceiling display cases of JUNK all over the living and dining room. :) Thanks for the walk down memory lane. That's it. It has become entirely apparent that I need to meet Fasha and PS ASAP. When can I come for dinner? I hit enter before I was ready for that to submit and somehow the first half got deleted, but it included the tidbit that my aunt is Korean and lives in a small palace in La Jolla and has managed to fill it up with more Asian choch-keys (I think the actual spelling has a "t" in there somewhere..whatever) than I ever thought possible. You walk down one hall...BOOM 9873458 fans and carefully sculpted works of art.